« On forming a Storytelling Guild or Work Study Group. 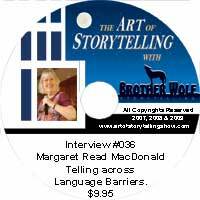 Fill out the form and press play to hear storyteller the Margaret Read MacDonald discuss Telling Across Language Barriers on the Art of Storytelling with Brother Wolf. Interview #036 Margaret Read Macdonald – Telling across language barriers for $9.95. In 1994 one day the phone on my desk at the Bothell Library rang. A professor from Drew University was on the line. “Dr. Wajuppa Tossa would like you to call her in Thailand right away,” he said. “She wants you to come over there as a Fulbright Scholar.” I hung up and sat stunned. A Fulbright Scholar. To Thailand? Could I do that? I had a fulltime job as a children’s librarian. But maybe; I dialed the Thailand number right away to find out more. A very drowsy Dr. Wajuppa roused herself from her 3 am sleep to answer. First problem with communicating across language barriers? Get your time zones right! It was in fact possible for me to go off to Thailand. The Fulbright program did accept me and the King County Library System gave me a sabbatical. So I arrived at the University of Mahasarakham ready to teach storytelling. I entered my first class eagerly. First shock;I had to leave me little high heels at the door;no shoes allowed in the classroom. Second shock;no one understood much of my English. Dr. Wajuppa and I soon developed a telling technique however. I learned to pause after each phrase and let her supply the phrase in Lao. We moved smoothly through each story and the students got both my inflections and tone while the meanings seamlessly flowed right behind. Since then I have used the techniques which Wajuppa and I developed while telling in Brazil with Livia de Almeida, in Japan with Masako Sueyoshi, in Mexico with Victor Arjona, in Cuba with ElvÃ­a Perez, in Argentina with Paula MartÃ­n, and through translators in Indonesia, Malaysia, Kenya, Taiwan, China, and The Republic of Georgia. The most tricky telling was one in Kota Kinabalu (on Borneo) in which I was translated into THREE languages. Tellers surrounded me;the first repeated my phrase in Bahasa Melayu, the second in Mandarin, and the third in Kadazandusun! Now THAT was a bit too much. I don’t recommend more than one translator at a time. For several years I was able to help plan the King County Library System International Storytelling Festival. We were able to bring two tellers from abroad each year, in addition to US tellers, and I was so pleased to be able to present tellers performing in French, Portuguese, Thai, Japanese, Spanish, and Arabic. In our podcast we can talked about ways to make translation work and discuss various techniques for telling stories via translation. I also want to stress the importance of exposing your own festival audiences to tellers who are telling in other languages. Just today I opened a package with my latest book in it: Tell the World: Storytelling Across Language Barriers (Libraries Unlimited, 2007). 39 tellers contributed articles about their own experiences in telling across the language barrier. So I may be sharing some of their stories too. Bibliography for the MRM podcast. These tales, books, websites were mentioned. “Strength” A Limba folktale. From Peace Tales: World Folktales to Talk About by Margaret Read MacDonald, August House Publishers, 2005. “Lifting the Sky” An Upper Skagit folktale. From Peace Tales: World Folktales to Talk About by Margaret Read MacDonald, August House Publishers, 2005. “Not Our Problem” A Burmese/Thai folktale. From Peace Tales: World Folktales to Talk About by Margaret Read MacDonald, August House Publishers, 2005. Tell the World: Storytelling Across Language Barriers by Margaret Read MacDonald. Libraries Unlimited, 2007. Techniques for storytelling through translation. Articles by tellers who have told in other languages or through translation. From the Winds of Manguito: Desde los vientos de Manguito. Cuban Folktales in English and Spanish by ElÃ­via Perez. Trans. by Paula MartÃ­n. Ed. by Margaret Read MacDonald. Libraries Unlimited, 2004. Speak Bird, Speak Again by Sharif Kanaana and Ibrahim Muhawi. University of California Press, 1989. Palestinian Arab folktales. Tunjur! Tunjur! Tunjur! A Palestinian Folktale by Margaret Read MacDonald. Illus. by Alik Azoumanian. Marshall Cavendish, 2006. Three Minute Tales by Margaret Read MacDonald. August House, 2004. Five Minute Tales by Margaret Read MacDonald. August House, 2007. The Storyteller’s Start-up Book by Margaret Read MacDonald. August House, 1993. Special offer books for podcast audience: Send check to Margaret Read MacDonald, 11507 NE 104th St., Kirkland, WA 98033. Booksharing: 101 Programs to Use with Preschoolers by Margaret Read MacDonald. Library Professional Publications, 1988. paperback $20 op OFFER PRICE $5. Bookplay: 101 Creative Themes to Share with Young Children by Margaret Read MacDonald. Library Professional Publications, 1994. Hardback $32. op. OFFER PRICE $5. Both are collections of pre-school storytime ideas, include simple craft ideas, songs, games, suggested picture books to form thematic programs for pre-school/primary. Cuentos que van y vienen by Margaret Read MacDonald. Trans. Paula MartÃ­n. Buenos Aires: Aique, 2001. paperback. OFFER PRICE $15. This is a Spanish translation of A Parent’s Guide to Storytelling (August House, 2001). Margaret began telling stories as a children’s librarian in 1965. She retired from the King County Library System in 2002 and has been traveling incessantly ever since. Her daughter and son-in-law, Jen and Nat Whitman (The Whitman Story Sampler), taught in Hong Kong for the past six years, so many trips were based out of Hong Kong. Now they are in Bonn, Germany, so Margaret’s near future travels may lean more in that direction. 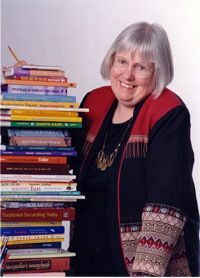 Margaret received her Ph.D. in Folklore from Indiana University in 1979 and published her dissertation as The Storyteller’s Sourcebook: A Title, Subject, and Motif-Index to Folktale Collections for Children (Gale Research, 1982). While teaching a course in storytelling for the University of Washington, she realized she needed a collection of sure-fire tales for her students to cut their teeth on. So she wrote Twenty Tellable Tales. Many more tale collections followed and now she delights in discovering tales most tellers have not heard yet and putting those into books for others to share. Her stories are all written with the next teller in mind. They are shaped for ease of telling. And she hopes that they will be taken up and passed on. In the last few years Margaret has been delighted to see several of her books translated. Into Spanish, Mandarin, Bahasa Indonesia, Korean, French, and Japanese. She was especially pleased at the chance to work directly with Paula MartÃ­n (Argentina), Jocelyn Chuang (Taiwan), and Masako Sueyoshi (Japan) in order to get translations which were ‘tellable’; not just literal translations. We worked with the texts until they sounded perfect in the translated language. This entry was posted on Thursday, December 6th, 2007 and is filed under Creating Success, Episode List, Griot, International Storytelling, Peace Storytelling, Storytelling in Community. You can follow any responses to this entry through RSS 2.0. You can leave a response, or trackback from your own site. Your comment in my blog led me to your wonderful site, which I know I will visiting over and over (Can’t wait to check Art of Storytelling with Brother Wolf #023!). Thanks for the tip on ways to read more about Margaret Read MacDonald – I am extremely interested in her work – I’m especially looking for some of her stories that have been translated to Spanish. The Free E-course is listed on the right hand side of the page underneath the Storytelling programs of Brother Wolf. Here is a direct link – E-course Signup – Tracking the College Big Cats. By the way have you listened to Playing for Keeps a hero based podcast in the itunes directory? Story Girl would fit right in…. PS: If you or anyone else has enjoyed listening to this show or any other a note addressed comment addressed to the person interviewed is always welcome. I’ve just read that there is a free e-course available ‘on working in a college setting’, but can’t find the reference on your page. Can you tell me where i can find the information. Thanks for all your good work, I really aprreciate listening to the podcasts and listen to my favourite ones several times over. I am pleased to tell you that if you had clicked the past and future guest list on the top of the page you would have seen a list of past guests that would make it easy to find you’re the show you missed! In addition you could activate iTunes on your computer by clicking the green iTunes button on the top right side of my website. This would allow you to download the whole history of shows and have them all on your computer forever. Looking forward to talking to you by phone. It’s raining here in Hawaii, and I just had a brutal appointment with my dentist, so I’ve been lowing low, tearning out pictures form Art in America for collages (with whatever free time I imagine I will someday have) and listening to your podcasts. I also prepared stories to upload to iTales.com. The first session I listened to was with Mary Margaret, and enjoyed listening to your dialogue, particularly with the references to the St. Louis Conference and the dinner we all enjoyed, since I was there. I do think we should all be feeding her stories, and she makes it pretty easy. Then I listened to Brother Blue. Though he was all over the place and repeated himself quite a bit, over dinner with my girlfriend Dominique I found myself moved recounting his devotion to the ’spirit’, rising to help the sun, asking for a story, loving dogs, becoming a Christmas tree for the kids, and his unwavering devotion to ‘the voice’. I can relate- it was inspiring in a way illustrating his point: There is a rational of the heart the the rationale of the mind doesn’t understand. I found Margy MacDonald listed but havn’t yet found how to listen to it. Sigh. AND… (lest I leave it with these manini (Hawaiian for tiny, puny, nit-picking) sharings, THE BIG THOUGHT: What a pleasure for a man totally dedicated to storytelling to be able to access these people on the podcasts! I am so very thankful for your work, Eric, for asking them on and making it available to us all. FREE! Unbelievable offering! Delightful, important, fun, and I listen with all of my ears! I thank you. As an invited guest in April I had lots of thoughts about how to fit all I have to share under “THINK BIGGER: One man’s blueprint for making Storytelling a Bigger Part of The Life of Everyman” (this is the title I’d like you to use- tried to email you but it came back). Sigh. You are on my Hero list Eric.